Awesome cake, Tiffany!! 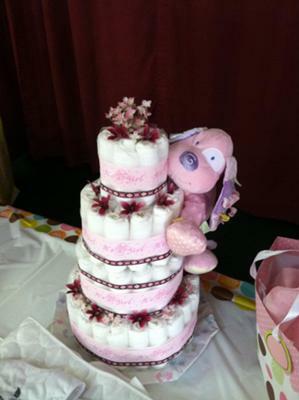 The pink puppy is adorable and it is a delightful first diaper cake :) Thanks for sharing!" Share your diaper cake with us right here! We'd love to post it on our diaper cake gallery. This was my first try at a diaper cake. I'm happy with how it turned out and will definitely be making more for future showers. It is a great way to show creativity because the possibilities are endless. This diaper cake contains 92 diapers (size 1). Other "ingredients" included baby bottles filled with candy (used to hold the cake together in the center), rubberbands, tulle, "It's a Girl" ribbon, other decorative ribbon, silk flowers (applied with hot glue gun), straight pins, fishing line, and of course, the pink puppy. I'm happy with how it turned out and will definitely be making more for future showers. It is a great way to show creativity because the possibilities are endless. Hello! Your cake is great! Thank you! I extremely inspired by your cake! Wow the pink puppy diaper cake looks so cute. Especially the puppy hanging around the cake. I like the color combination. Hats off to the one who is behind this cake. This was my first try at a diaper cake! This puppy diaper cake is looking beautiful. Your idea is uncommon and everybody will like this cake for birthday of their baby.